Small SUVs, especially 2WD variants, are something of an anomaly in the makeup of the modern motoring landscape. They rarely offer the same space or practicality as a comparable hatchback, and they almost never deliver driving ability or comfort anything like that of an SUV. Therefore, in objective terms, they don’t seem to do anything especially adeptly – on paper at least. Regardless, their rampant popularity hasn’t stop manufacturers piling on to join the circus. Two of the newest additions to the segment aren’t refreshed variants, but all new models – the 2017 Audi Q2 and the 2017 Mini Countryman, models we’ve put head-to-head right here. Actual titles: Audi Q2 1.4 TFSI S tronic design Edition #1 and the Mini Cooper Countryman. Let’s avoid referring to them by their full names then shall we? The Audi Q2 follows hot on the heels of the rampant success of the Q3 and the Mini Countryman, while being counter intuitive to the Mini name, has proven to be the brand’s most successful model globally. You could in fact argue the Mini Countryman should be called Maxi, but that’s another story entirely. In such a competitive segment, pricing is the real battleground despite most buyers claiming they choose based on styling first and foremost. You might love the look of a vehicle, but that doesn’t count for much if you can’t afford it. Sharp pricing and the competition around it, is very much the case in any of the compact segment – hatches, sedans or SUVs. The Quantum Grey paint is a no cost option, while the Edition #1 package is also factored into the price as the name would imply and includes: illuminated inlays in format design with LED interior lighting package, three-piece folding second row seating, rear centre armrest and cupholders, sports front seats, leather Milano upholstery, LED headlights and LED rear lights with dynamic indicator and privacy glass (rear side windows and rear window) and exterior trim highlights. The aforementioned $1600 Assistance Package brings with it: adaptive cruise control with stop/go including pre-sense front, Audi active lane assist, Audi side assist, high-beam assist, hill-hold assist, park-assist and rollover sensor. I’d argue you really need to spend the money on this option package given the active safety it brings to the party. 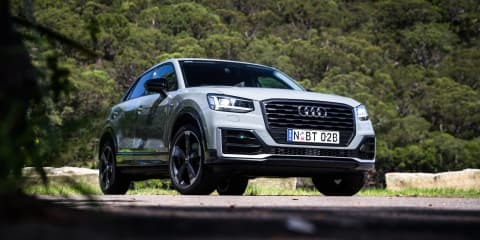 All told then, the Audi Q2 as tested here will cost $49,400 before the usual on-road costs are added into the equation. The Countryman on the other hand, starts from a hard to believe $39,900 and effectively comes standard with everything you need. It doesn’t feel as premium as the Q2, but regardless, that price is pretty damn impressive – especially when you look at what it gets. Standard feature highlights include: active cruise control with stop and go, electric tailgate, autonomous emergency braking, Bluetooth connectivity with audio streaming, cloth/leather upholstery, DAB+ radio, keyless start, Mini visual boost media interface with 6.5-inch monitor, satellite navigation, park distance control front and rear with park assist, rear-view camera, speed limit info display camera based and the storage package with flat load floor. The only option fitted to our test vehicle is the Chilli Package, which costs $1500 and includes LED headlights with LED DRLs, LED foglight and Driving Modes. The cost therefore is $41,400 before on-road costs are added, or a whopping $8000 less than the Audi Q2. You’d expect the Audi to trump the Mini under the bonnet, and that is very much the case both on paper and in the real world. The Q2’s 1.4-litre TFSI engine generates 110kW between 5000-6000rpm and 250Nm between 1500-3500rpm. It’s mated to a seven-speed S tronic gearbox and uses an ADR-claimed 5.6L/100km. The Q2 has a claimed 0-100km/h time of 8.5 seconds. On test we used an indicated 8.1L/100km. Under the bonnet of the Mini, you’ll find a spritely 1.5-litre triple, which beats the Audi in capacity but not cylinder count. We love triples at CarAdvice due to their unique characteristics, and this could be the best example of that type of engine we’ve sampled. The three-cylinder makes 100kW between 4400-6000rpm and 220Nm between 1400-4300rpm, drives through a six-speed automatic and uses an ADR-claimed 6.0L/100km. The 0-100km/h sprint takes 9.6 seconds, further illustrating the performance difference between the two in real terms. On test, we used an indicated 10.2L/100km, which goes some way to indicating the fact the engine has to work a fair bit harder than the Audi’s. The Q2 has that insulated, quality feel we’ve come to expect from Audi but doesn’t feel quite as premium as we’d hoped. There’s nothing especially wrong with any of the materials used, but there is something about the overall design that doesn’t quite gel with the stylish exterior. That’s despite the fact the Audi leather definitely feels more premium than the cloth/leather mix in the Mini. The Audi’s seats are excellent, firm enough but also comfortable and getting into your preferred driving position is easy. The seats do seem to be a size smaller than the Mini though, and don’t offer quite as much support. While there’s plenty of room up front, the second row suffers – as do most SUVs in this class – and taller occupants will struggle for head, knee and shoulder room in the second row – knee room especially is compromised. While on the subject of the second row, there are no rear air vents and no power inputs back there either. There are proper-sized bottle holders in the doors, cup holders ahead of the shifter, as well as 12V and USB inputs at the lower section of the centre console. There are further inputs inside the console armrest section between driver and passenger. The infotainment screen is clear and works well, but I’m at a loss as to why you’d provide Apple CarPlay/Android Auto and no touchscreen functionality. It seems to my mind at least, to almost defeat the purpose of smartphone integration in the first place. You can work out the rotary dial control easy enough, but Audi really needs to endow the Q2 with a touchscreen. While the seats fold down easily in 40:20:40 fashion and liberate a large, flat load space, waltzing up to the back door with a shirt that needed hanging revealed a surprising omission. There is no grab handle or coat hook in the second row at all – another silly oversight. On the other hand, the Q2’s LED mood lighting is cleverly designed, beautifully executed and delivers a real high-end feel to the cabin, especially at night. It’s still visible during the day too, and definitely makes the cabin feel special. The presence of it makes some of the other decisions on what not to include seem even more nonsensical. The Countryman on the other hand, feels a lot more like an expensive model grade than the entry level grade it is in reality, and that is never more obvious than inside the cabin. Some elements jar with that quality a little, however, such as the steering wheel controls, which aren’t easy to decipher quickly and seem overly complicated. The seats are a step beyond those of the Q2, though. The under thigh support is excellent, there’s plenty of adjustability, and quality side bolsters. The Countryman’s dash is so deep, it actually makes the cabin feel bigger than it is, and you sit further away from the screen than you normally would, too. Despite that point of difference, the driving position is excellent – something we couldn’t always say about the old model – and the seats themselves are nicely sculpted. We found them to be comfortable no matter how long you spend behind the wheel, and while they don’t feel as premium as the Audi’s, they definitely fit with the ethos of the Mini’s cabin. Throughout, there are quality finishes, plenty of soft-touch materials at touch points like the tops of doors, and other rest points where your elbows will make contact with consoles, for example. That theme also continues into the second row, an area that often gets overlooked. The menu breakdown for the infotainment system is easy enough to work out, but there’s no doubt the screen itself is a little naff. It’s an expectation that Mini fans would have – the large central circular design that harks back to the 1960s original – but it absolutely isn’t the best way to lay out an infotainment system in 2017. However, Mini designers have made the best of the expectation they have had to work with. No Apple CarPlay/Android Auto isn’t a deal breaker in itself but it does let the Countryman down against the Audi Q2 in this test. The gauge cluster above the steering wheel moves up and down with the adjustment of the wheel so it’s always in the best possible field of view and not obscured by the steering wheel position. The centre console is spacious and the adjustable armrest is a clever touch too. The Countryman gets bottle holders in the doors, cupholders ahead of the shifter, second row air vents and only a 12V input in the second row. The seat bases slide fore and aft though, which aids in the comfort factor back there and in comparison to the Audi, the Mini has more leg, knee, head and shoulder room no matter who is driving up front. You can fit a six footer in the second row easily, behind a six footer up front – it’s surprisingly comfortable and spacious. Like the Audi, the Mini’s luggage space flies in the face of its compact dimensions, with access via an electric tailgate. You can raise and lower the tailgate from the remote fob too, which is very handy if it’s raining. There’s a quality, solid parcel shelf cover and a flat boot floor, that continues through into the second row when the seats are folded down (40:20:40 like the Audi). The LED lighting package, the colour and the general design of the Q2 ensures that it feels – and looks – a lot more premium than the Mini. The Countryman isn’t ugly in isolation, but park it next to the Q2 and there’s little doubt which vehicle more people will find most attractive. Interestingly, while the Q2 is a fair bit pricier, the Mini definitely needs it’s $1600 Chilli package – and the associated LED lighting that comes with it – to compete in the appearance stakes with the Q2, so you can’t really avoid spending that extra $1600 if you want the Mini to have as much presence as it can muster. We loved the Audi’s Quantum Grey exterior and the twin colour alloy wheels. The colour has that real Q-ship appeal to it, but looks so much classier than matte and works really well with the sharp styling of the Q2. Likewise the satin black and brushed silver wheels, which set the paint colour off perfectly. As with most comparisons of this nature, the proof is in the driving, and there’s nothing different this time either. While the Audi’s numbers aren’t massively different to the Mini’s on paper, the Q2 is a decidedly snappier performer on the road, which only gets more apparent the harder you drive the two once you hit the twisty sections. The power and torque figures are close enough but there’s more than just the numbers, with a lot to be said for how and where that power is delivered when things play out on the road. The Audi is almost always composed and smooth. The gearbox can, like most dual-clutch examples, lurch a little in traffic at slow, crawling speed. You get used to it, and you start to drive around it pretty quickly, but it’s something you’ll notice at low speed. Unlike the Mini, the Audi gets no drive modes, but the standard stop/start system is really quick and works well without any nastiness when the engine kicks back into life. While the gearbox isn’t always perfect, it’s sharper, and more precise than the Mini’s, more attuned to being punted, more rewarding when you do. More than one CarAdvice tester opined that the Q2 rides a little firm around town. It’s only an issue over sharper inconsistencies and speed humps, but it’s noticeable enough to pick up over most road surfaces. Undulating dips and bumps are less of an issue, and the Q2’s firmer ride definitely results in a planted, secure feel on the road. There’s also more road noise entering the cabin in the Q2. The Audi has superior steering, sharper turn in, better balance and more assured handling in this comparison, especially when you hook in with any enthusiasm. it simply feels like a more lively, enthusiastic SUV. The firmer suspension tune comes into its own the second you ask the Q2 to shift weight, tip in or exit a corner, and flow quickly though a sweeper. 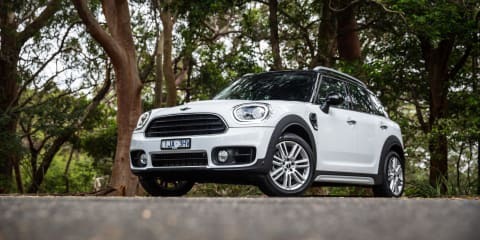 It’s a much more planted SUV to drive rapidly, of that there is no doubt and the front end feels much more reliable and connected than the Countryman. The Mini, on the other hand despite being less sporty, gets driving modes, which include Sport, Normal and Green. Sport mode has a noticeable impact on steering, transmission and throttle response, but I still wonder why it’s there at all in a segment (and vehicle) that doesn’t scream sports performance. We noticed a sticky sensation in the steering at low speed too in Sport mode, where the wheel didn’t want to unwind without some coaxing. The Mini’s is unequivocally the more comfortable of the two. It soaks up bumps with more cushion, less fuss, better damping under almost all circumstances. It can be unsettled over repeated poor surfaces, like any compact SUV, but it takes plenty of punishment before then. It’s much more comfortable nearly all the time compared to the Q2. The flip side is it doesn’t handle as cohesively and will protest once you push harder. The tyres made noise at the limit for example, where there wasn’t a peep from the Audi. Like the Audi, the Mini’s stop/start system is excellent, and the engine doesn’t feel like it’s struggling unless you really try to chase the Audi down. The Mini simply isn’t as sport-focused or effortless in outright terms. This segment isn’t focused on that, though, so take that with a grain of salt. Under all other driving conditions, the Mini is refined and quiet. If you value performance and handling, there’s no doubt the Q2 is the vehicle you’ll most enjoy. It’s easier to drive faster and more rewarding when you do. If however, like most owners of these small SUVs, you’ll be spending nearly all of your time around town at city speeds, the Mini is the better of the two. Both have smooth, refined engines and excellent transmissions, brakes that always work well, steering that is geared to low speed effortlessness, the perfect blend for the targeted buyer. There’s little doubt the Audi Q2 is a more stylish vehicle, more likely to appeal to more people, more often. Aside from dyed-in-the-wool Mini fans, that is. However, on just about every objective measurement we assess for a CarAdvice twin test, the Countryman is the superior vehicle. In fact, it’s not even as close as we expected after a solid few days behind the wheel. Take the lack of Apple CarPlay/Android Auto out of the equation and the fact the Q2 is more impressive at nine-tenths and beyond on a twisty road, and the Mini Countryman is the clear winner. The Q2 is an excellent compact SUV, there’s no doubt, but the Countryman just nails the desired brief more comprehensively. We didn’t expect it from the outset but surprise results are often the most enjoyable when it comes to putting two vehicles head-to-head. There’s no doubt then the Audi Q2 is an exceptional small SUV that looks beautiful from any angle, but when it comes to standard inclusions and value for money, the Mini Countryman is unbeatable in this contest.